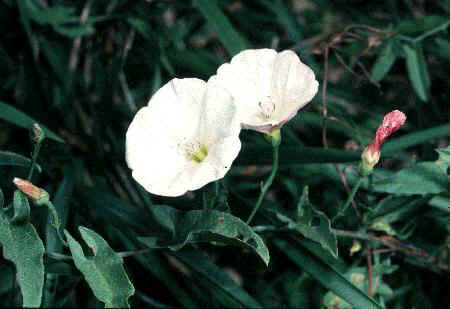 Field bindweed is a perennial that reproduces by seeds and rhizomes. Vines many feet long trail over the soil and vegetation and often form dense mats. Leaves alternate along the stem and are attached to it by a short leaf stalk or petiole. Leaf size and shape may vary considerably; typically leaves are up to two inches long and ovate (egg-shaped) with a pair of basal lobes pointing down and/or outward. Flowers are funnel-shaped, one-inch in diameter, white to pinkish, and borne singly on long flowerstalk. Two small bracts (appendages) on the flowerstalk, 1/2 to 2 inches below the flower, distinguish field bindweed from hedge bindweed. Information referenced from "FIELD BINDWEED A Noxious Weed in Kansas" published by the Kansas State Board of Agriculture Plant Health Division, June 1986.